Termites, ants, and other wood-burrowing insect pests can be a real plague for any household or storage area. If left unchecked, they can literally collapse entire structures or in the very least – ruin their foundations, walls, and furniture. As such, there are countless products dedicated to the extermination of these insects as well as the prevention from their infestations. A lot of these products are intended for a wide application all around the endangered property, but there are situations when you need a more localized solution. This is where the ant and termite sprays come under the spotlight. Good termite and ant sprays are usually meant as on-contact products that kill individual insects when you spray them directly. In terms of exterminating entire nests or colonies, this isn’t always the most practical solution unless you can localize the nest and spray directly in it via the insects’ natural pathways and cracks or after drilling some holes into the nest. This isn’t always possible and other products may be needed, but termite killer sprays are still useful – they can be used to mop up leftover insects from a more heavy-duty treatment, they can be used to prevent an incoming infestation by killing the initial insects, they are great at dealing with a lot of wood-burrowing pests that remain confined into single wooden pieces, and they can be useful at dealing with random individual pests that have just wandered into your home. Simply put, ant and termite killer sprays are versatile tools that can easily find a place in any household. How does one go about buying them, however? There are countless different products and brands on the market right now and differentiating between high quality and subpar items can be tricky. 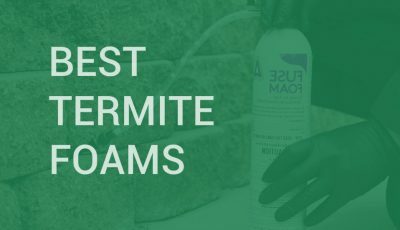 To help you out with that, we’ve compiled a quick list of the best termite sprays we could find on the market right now. We have also followed it up with a detailed guide on how to choose the right spray for your situation, how to use, and a lot of other additional information. 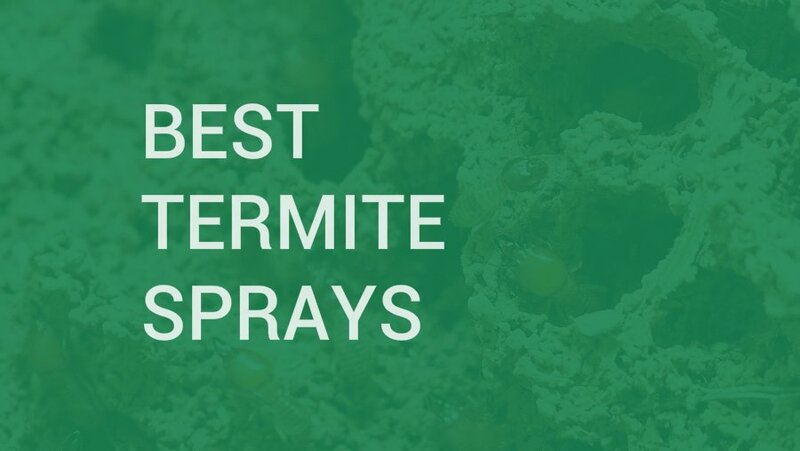 But first, let’s kick things off with our Top 3 list of the best ant and termite sprays! The Terro Carpenter Ant and Termite killer spray is a fast-acting aerosol spray that kills ants and termites on contact. What’s more, it also has a residual effect of up to 4 weeks, depending on how thick the sprayed layer is and on what surface it was sprayed. This makes the Terro carpenter ant aerosol spray one of the best home termite spray products on the market. The Terro ant and termite spray also uses a flexible nozzle that allows for a 2-way precision spraying – wide spray for flat surfaces or a more precise nozzle application for the inside of nook and crevices. This allows the Terro spray to be used as an indoor termite spray for all the cracks and crevices of your home, as well as an outdoors treatment spray on the outside walls of buildings, warehouses, garages, sheds, fences, and other similar places. The Terro Carpenter Ant and Termite Killer Aerosol Spray works on more than what its name would suggest – it successfully wipes out most types of ants and termites, as well as a wide variety of other wood-infesting insects such as beetles, bores, carpenter bees, wood wasps, and others. To successfully apply the Terro ant and termite killer spray, first, localize the area of the infection – the insect tunnels and cavities in the wood or other surfaces. In infested inaccessible and closed voids you can drill small holes every 8 – 10 inches to ensure an effective and efficient gallery treatment. Once that is done, stick the spray’s nozzle into the holes or crevices and spray at will. Be careful, however, that if you happen to hit an electrical wiring or plumbing when applying the treatment you may cause damage to it. The Terro aerosol is one of the best termite spray products on the market in terms of its killing power and effectiveness. The termite killer chemicals it utilizes allow for fast kills right after contact. The Terror spray can be used as both an outdoors and an indoor termite spray. The spray’s nozzle allows for flexible applications both in tight spots, nooks, and crevices, as well as on wide areas. The spray’s nozzle, while flexible, also makes for some messy experiences. It’s not uncommon for the spray to come out of both the cap and the nozzle when spraying or when decompressing, so it’s advisable to wear rubber gloves when applying the spray. If you are looking for the best termite killer spray made from natural ingredients and with zero toxic chemicals, take a look at the Cedar Bug-Free Termiticide Termite Treatment Spray. It is a highly effective termite treatment spray against all types of wood infecting insect species such as drywood termites, subterranean Formosan termites, powder post termites, carpenter bees, carpenter ants, and my other types and species. As one of the best termite spray products on the market, the Cedar Bug-Free termiticide spray has a great penetrating power and go deep into the wood on which it has been applied, even through paint, stains or varnished spots. What’s more, in doing so it also has a very good long-lasting protection effect, essentially making it a one-time termite treatment spray. The Cedar Bug-Free termite treatment spray is also a non-staining product that uses no toxic chemicals. It is safe to use on all types of surfaces without leaving ugly and unpleasant stains or without giving off any unpleasant odors. It’s safe for use around pets and children, making it one of the best termite spray products for indoor use, while still being quite effective for outdoor use as well. To properly use the Cedar Bug-Free termite killer spray and turn it into one of the best termite killer sprays in your hand, you’ll need to apply it thoroughly on the targeted surface. Don’t just spray the nooks and crevices as you would with a more toxic spray, but instead aim to cover the entire area, including all the cuts and end of pieces. If you apply three thick coats onto the whole surfaces you’ll be guaranteed to deal with any wood insect infestation. The Cedar Bug-Free Termiticide Termite Treatment spray contains 100% natural ingredients, making it a great choice for people who don’t want to use overly toxic solutions in their home. This means that it is great both indoors and outdoors. The Cedar Bug-Free spray is safe to use around pets and children. Applied correctly, the Cedar Bug-Free treatment spray has a long-lasting effect and works as a “once in a lifetime” application spray. The Cedar Bug-Free Termiticide Termite Treatment Spray is not a kill upon contact spray. Instead, it’s a termiticide solution that needs to be applied thoroughly over the nesting areas of the bugs to have a significant long-term effect. 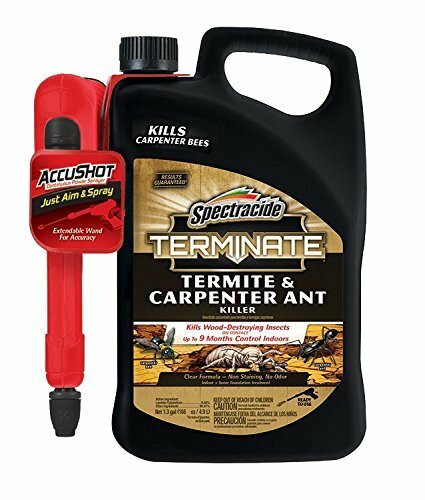 You won’t need to go over too many Spectracide Terminate reviews to determine that this is a great product for use against termites, carpenter ants and a lot of other wood-burrowing or crawling insects, including carpenter bees. Utilizing highly effective termite killer chemicals, The Spectracide Termite and Carpenter Ant Killer spray is one of the strongest on-contact sprays you can possibly purchase. This, of course, means that it’s intended for localized application only, and isn’t effective as a surface area long-term treatment solution. That being said, the Spectracide termite killer spray can provide up to 9 months of continuous indoors control against carpenter ants thanks to its residual effect. The spray also comes with a battery-powered sprayer handle which makes continuous spraying much easier and reduces hand fatigue while applying the product. The nozzle can easily adjust from stream to spray to easily adjust to wider or narrower areas of application. The spray is safe enough to use indoors while also being strong enough to be effective outdoors around your home on porches, foundations, wood fences, decks, and other similar surfaces. Aside from termites carpenter ants and carpenter bees, the Spectracide spray killer can also be effectively used against wasps, centipedes, millipedes, scorpions, box elder bugs, sowbugs, spiders, pillbugs, flies, Asian beetles, mosquitoes, and others. The Spectracide Termite and Carpenter Ant Killer spray is one of the strongest on-contact bug killers on the market right now. This product comes in a large 1.33 gal tube, giving you plenty of spray to work with. The spray has a battery-operated handle which makes continuous use easier. It also has a flexible nozzle that can be used both for tight and narrow crevices, as well as on wide surfaces. While the Spectracide Termite and Carpenter Ant Killer spray has a residual effect, it’s more so intended as an on-contact killer. For wide surface treatments that intend to have a strong long-term effect, there are other products you can consider. The Top 3 products we listed above are not only highly effective at what they do but they also are quite diverse in their contents, their method of application, as well as in their intended purposes. And while this makes them a great collection of suggestions, there are two other products that we also wanted to fit in that Top 3 but that just couldn’t make the final cut. Regardless, they are both great items that can be of use in your fight against termites, ants, and other annoying insect pests, so give them a quick look as well. The BioAdvanced Carpenter Ant and Termite Power Sprayer can be used both indoors and outdoors as an on-contact termite killer spray. The active ingredient in this termite spray is 0.02 percent Deltamethrin which is efficient at killing and controlling termites, carpenter ants and over 60 other pests. However, you will have to use the battery-operated sprayer applicator to apply the product which can be a hassle and makes this spray only a runner-up. This Time Out Eco-Friendly Insecticide For Termites is a very good eco-friendly solution for most situations. It kills both wet and dry wood termites, it utilizes a non-toxic formula and has a study supported efficacy. It’s environmentally friendly, making a good choice for both indoors and outdoors uses, and its applicator allows it to easily fit into even the narrowest crevices and cracks. As a natural-based spray, however, it is naturally weaker than the more heavy-duty chemical solutions you can purchase instead. 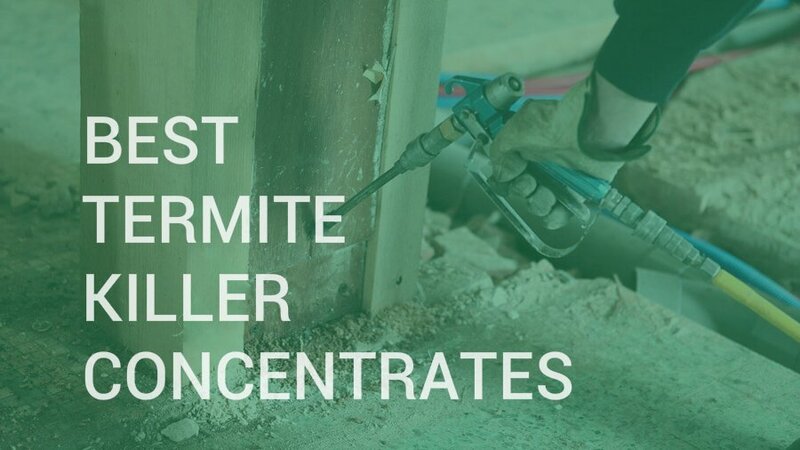 Termite sprays work on a very similar principle to other bug sprays – they contain a mix of chemicals that are deadly for the targeted insects upon contact with them and so they just need to be sprayed over the insects. Termite sprays can either have a more chemical and toxic mixture of ingredients such as Cyfluthrin or be more natural-based on plant extracts such as cedar. Either way, whether a spray is natural or chemical, it can still be effective. Generally, chemical sprays are stronger and more effective, while natural ones are less powerful and therefore – safer for your family, kids and pets. However, there are still subpar weaker chemical sprays and high quality and stronger natural ones, so don’t just look at the label as a deciding factor for how effective the product is going to be. Most termite sprays are intended for a direct usage. They are meant to be sprayed right on top of individual insects or directly into their nests and colonies, provided that you’ve found a suitable opening inside of them. If you can’t find a good crack or crevice to spray the product in but you are certain about the location of the nest, consider making several drilling holes to it and spraying inside of them. Other – typically more natural-based – sprays are meant to be applied over and around the insects’ nest. For example, if you’ve localized a carpenter ants’ nest inside of a porch, such products aren’t meant to be sprayed inside the nest, but on top of it. They are meant to be applied on several thick layers over the entire porch, particularly well covering its edges, corners, and cracks. Such sprays are usually long-term solutions that can have an effect for months or even years after their application. As you can see, ant and termite sprays are really situational tools. They are great for localized situations when you’ve found a particular nest you want to deal with. 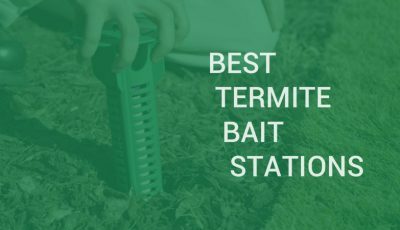 However, if you have swarms of termites coming to your home from unidentified underground locations other products can be more effective – termite bait stations in particular. Also, if push comes to shove, you can also come an exterminator, but in those situations, you’ll certainly be well beyond the use of a single termite hand sprayer. Buying the right termite spray for your situation is dependent on several factors, chief of which is knowing what type of termites or other insects you’re dealing with. Termite bug sprays are usually similar in their effects but they still have differences in the active ingredients they utilize which makes every individual product more or less effective against different insects. To buy the perfect product for your situation you first need to know what kind of pests you’re dealing with. The next question to ask yourself is whether you want a more natural-based product or you’d rather use a heavy-duty chemical sprayer. The latter types are usually more effective and offer greater exterminating potential, while the former can still be effective if they are good enough, while also being more protective for the health of your family, kids, and pets. The quantity of the spray is also something to consider – do you need a giant tube of poison to spray all around your warehouse and yard or will a simple, small hand sprayer suffice? Buying more than you need can be a waste, but having to buy additional sprays a week later can be annoying as well. Next, ask yourself whether you need a spray that’s intended for an on-contact use with a slight residual effect, or would you rather have a spray that’s intended for a wider and more long-term application? 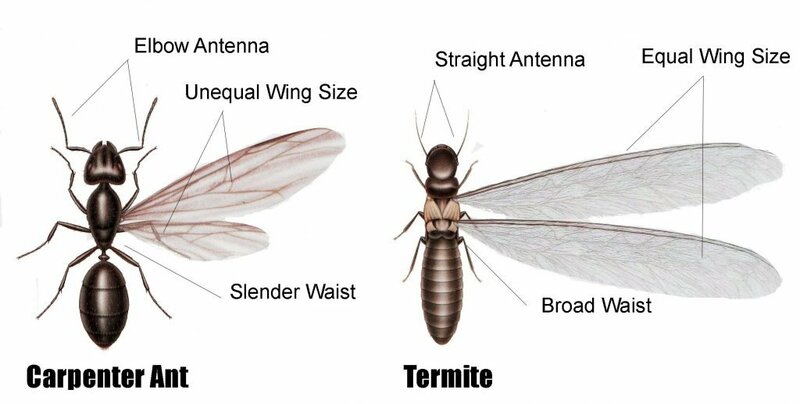 These two main types of termite sprays require different ways to be used and can have drastic differences in their effectiveness, depending on how you apply them. Of course, the price is always a consideration here as you don’t really want to spend extra money unnecessarily. However, keep in mind that buying a subpar product is essentially the easiest way to waste your money as it will likely be unable to do anything for your bug problem. Discerning between high and low-quality products can be challenging, especially if you are new to this niche. Reading a ton of user and industry reviews can be needed and it’s quite tiring, considering the astounding amounts of misinformation online. Still, a different consideration you can apply is the brand of the products. Not all top brands are really worth looking at and there are more unknown brands that do have high-quality products, but generally speaking, most brands that are known for their quality are known deservedly so. The brands we’d advise you to consider first are the following: Cedar Bug-Free, Terro, Time Out, Spectracide, and others. Most termite and ant killer sprays are marketed as carpenter ant and termite sprays. And indeed, while they are also effective against other types of insects, most such sprays tend to be most powerful against termites and carpenter ants in particular. What’s the difference between these two insects, however? Does it matter that they are different? Well, it does. For starters, some sprays are more effective against termites than they are for carpet ants, and others are the other way around. So, knowing what you’re dealing with can help you make a better purchase. Additionally, termites and carpenter ants have different nesting habits so differentiating between the two can help you easier locate their colonies. So, what are the main differences between termites and carpenter ants? The way they feed and nest is the prime thing to note here – termites feed on the wood itself as it is an important source of nutrition for them. Carpenter ants, on the other hand, don’t eat the wood but just dig passage tunnels through it and nest inside of it. As a result of that, carpenter ants can be more frequently seen on the surface, while termites remain hidden for longer. Termites have straight antennae while carpenter ants have crooked and elbowed antennae. Termites have broad waists and their separate body segments are hard to identify. Carpenter ants, on the other hand, have highly segmented body parts and pinched waists. Simply put, carpenter ants look much more like regular ants. The two sets of wings on termites are of equal lengths. Contrary, the frontal wing set of carpenter ants is longer than the back set, which is quite easy to spot. Additionally, termites have much longer wings that are usually two times the lengths of their entire bodies. Carpenter ants, however, have shorter wings, with the front sets being about as long as the ants’ bodies and the back set being even shorter than that. As you can see, properly identifying termites from carpenter ants isn’t that difficult once you know what you’re looking for. As we said, however, it is often quite important, especially if you want to find the pests’ nests as quickly as possible. Apply on-contact sprays from as close of a distance as possible A good sprayer will have a powerful nozzle that can spray it at a distance, but you really don’t want any excess spray particles flying in your home’s air. If you’re spraying outside this is less of an issue, but even then you will want to apply the spray as directly as possible simply to increase its effectiveness. The more of the spray you get on the insect, the higher the killing rate is going to be. For sprays with significant residual effects, make sure that you are applying them to the right locations. Spraying the middle of your kitchen floor won’t have that much of an effect in the incoming weeks even if you managed to kill that one wasp that was crawling on it. Instead, spraying on top of or inside of nooks, cracks, and crevices that the insects tend to crawl in and out of is a great way to kill many of them as they pass through in the following days and weeks. The most effective application of an ant and termite spray is to spray it directly into the insects’ nest or colony. If you can find an opening that leads straight into the nest this can give you the ability to kill hundreds and thousands of insects with each individual press of the spray’s button. If you can’t find openings into the nest but you know roughly where it is, drilling holes into the surface at intervals of 8 – 10 inches can create a powerful gallery gassing effect that can fully exterminate the entire nest. For termite sprays intended for wider applications, the way to use them is usually by applying them on top of the infested piece of wood/wall. They are typically natural products and don’t need to be applied directly on the insects themselves but are meant to cover the entire circumference of their nest – every square inch of it, every edge, every crack, and every corner. Applying a spray in such a manner – especially in two or three layers – can virtually guarantee the full extermination of the entire colony inside the piece, as well as prevent any further infestations in the future. “Know your enemy” is a principle that applies to ant and termite sprays as it does to other products and situations. Before you buy or use anything it’s good to know what you’re dealing with – different sprays are effective against different insects. Take precautions. Read the label on the product carefully and if necessary – use rubber gloves and protective headgear when using the spray. Termite and ant sprays are an important tool in the arsenal of any homeowner. They help deal with both individual insects as well as whole nests of pests if they’ve been localized and are treated properly. A quintessential product for exterminating termites and other insects, bug sprays can come in various different shapes, sizes, and chemical contents. You can use an all-natural bug spray that’s perfectly safe for your family and pets, or you can use some highly toxic termite sprays to ensure effective and efficient kills. Usable both indoors and outdoors, most good termite killer sprays offer a lot of versatility and ease when it comes to dealing with bugs. Of course, they do have their downsides – even sprays designed for wider and more long-term application are still mostly meant for localized use only. This means that if you are facing a full-blown mass infestation you are going to need a different way to deal with the problem unless you want to spray multiple bottles of killer spray around your house at once. However, aside from such situations – and also to prevent them from ever happening – bug killer sprays are a great asset for your household. To wrap things up, here are our Top 3 suggestions for the best ant and termite killer sprays once again. The Terro Carpenter Ant and Termite Killer Aerosol Spray is a highly toxic and efficient way to deal with various types of wood-burrowing insects on contact. It kills pests extremely quickly and has a residual effect of up to 4 weeks. There has been some reported issue with the nozzle at times, but the spray itself is a great option for dealing with unwanted insect visitors. If you are looking for a more natural solution, the Cedar Bug-Free Termiticide Termite Treatment Spray is a great option. It’s 100% natural and safe for pets and people, and it’s designed for a wider application in multiple layers on top of infected furniture, walls, and other item pieces. It has a long-term effect and is essentially a one-time termite treatment spray. The Spectracide Termite and Carpenter Ant Killer is pretty much the opposite of our previous entry. It’s a highly toxic solution, specifically designed for immediate on-contact extermination. It does have a residual effect on carpenter ants but it isn’t meant for a wider application but almost entirely as an on-contact killer. It has a battery-operated handle and comes in a tube of 1.33 gal. Why Are There More Mosquitoes After a Hurricane?